As we mentioned when discussing the Charter, the University of Bradford received its Grant of Arms when it was founded in 1966. This document gave the University the right to display the armorial bearings or “Coat of Arms” designed for it by the College of Arms. Here we explore the symbolism of the Coat of Arms. As usual in heraldry, the Coat of Arms is packed with meaning. Every feature makes a point, about the University’s Yorkshire location or its technological emphasis at the time the design was created. Although the University now studies social sciences and humanities alongside the original technological subjects, its enduring emphasis on practical application of knowledge makes the original meaning still appropriate. Shield. The white Yorkshire rose on a red background signifies the West Riding: the colour is used in the arms of Bradford itself. The book on the shield symbolises a university. The seven clasps represent the quadrivium and trivium: the groups of four and three related studies which were the typical medieval university subjects. The horns symbolise the city of Bradford, taken from the legend of the Bradford Boar (of which more in the document below). Crest. Above the shield, the closed helm shows that the arms belong to an organisation rather than an individual. The red and gold colours are the Bradford liveries. The torch symbolises enlightenment and progress, and is often used in heraldry for technological education. It contains seven sun-rays, the wavy symbolising heat and energy and the straight for light, showing natural forces tamed to serve humanity. Supporters. The falcons imply “aspiration and determination in technological studies”, as they were sacred to the sun-god Horus through their supposed ability to fly towards the sun without being dazzled. They also relate to the white falcon badge of the House of York, particularly favoured by Edward IV, who was lord of the Manor of Bradford. Motto. “Give Invention Light” is a quotation from a Shakespearean sonnet, appropriate to a technological university. I talk through the elements of the Coat of Arms in this short film, made to accompany the 2011 graduation ceremonies. 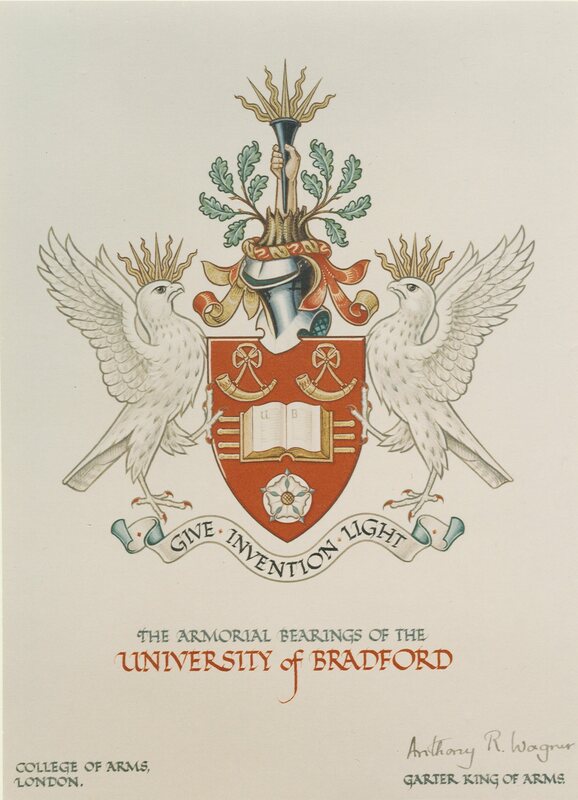 For further detail, see The Armorial Bearings of the University of Bradford, a digital version of a document produced in 1966 by the Information Office to explain the design to staff, the press and other interested parties. The Coat of Arms also forms part of the University’s logo, which was developed in 1993. It features the book (university), the horns (Bradford) and sections of a globe to represent the University’s international connections. This entry was posted in Bradford, University of Bradford and tagged Bradford, Coat of arms, Heraldry, University of Bradford. Bookmark the permalink.